Assembly was released in June 1992 as a retrospective compilation of Foxx's best work to date. Assembly contains tracks from his first four albums – Metamatic, The Garden, The Golden Section and In Mysterious Ways. The album was remastered for CD by Foxx himself, and was the first time many of his solo tracks had appeared on CD. 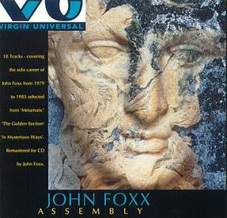 Although it contained Foxx's key single releases, Assembly also contained several specially selected album tracks, which represented more of a 'best of' unlike the later compilation, Modern Art, which was primarily a collection of the single releases. The sleeve of Assembly features one of Foxx's Cathedral Oceans images, although at this point, none of the music from that project had been made available.